If you need to print your work in Excel, this tip would save you some papers. 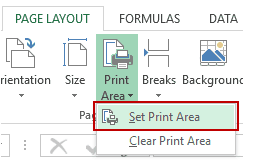 Using this, you can set the print area in Excel worksheets, so that only that part of the worksheet is printed. This technique could be useful if you want to print only a part of a report or there is a section of the report that you need to print often. A print area is a range of cells (contiguous or non-contiguous) that you designate to print whenever you print that worksheet. For example, instead of printing the entire worksheet, if I only want to print the first 10 rows, I can set the first 10 rows as the print area. How to Set the Print Area in Excel Worksheets. How to Modify the Print Area in Excel. How to Clear the Print Area in Excel. Select the range of cells that you want to set as the print area in that Excel worksheet. Go to Page Layout –> Page Setup –> Print Area –> Set Print Area. This would set the selected cells as the print area. It also creates a named range for the selected area (the name Print_Area would be visible in the Name Box). Now when you print this worksheet, only the set print area would be printed. Here are some important things to know when you set the print area in Excel worksheets. There can be multiple print areas in a worksheet, however, these are printed separately. To selected multiple areas, hold the Control Key and make the selection using the mouse. A print area specified using the above steps is specific to that worksheet only. Hence, you can set different print areas in different worksheets. When you save the workbook, Excel saves the print area as well. The next time you open the workbook, the print area would still be there. When you set print area in different worksheets, a named range Print_Area is created for each worksheet. Select the cells that you want to add. Go to Page Layout –> Page Setup –> Print Area –> Add Print Area. 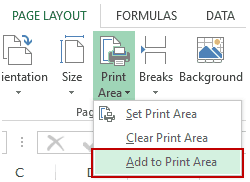 Note that the option to Add Print Area would be visible only when you have an existing print area in the Excel worksheet. This would modify the print area and include the new cells. 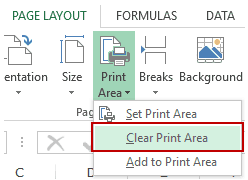 When you add additional cells to the print area, the named range Print_Area changes. You can directly edit the named range to modify the print area. Click anywhere in the worksheet from which you want to clear the print areas. Go to Page Layout –> Page Setup –> Print Area –> Clear Print Area. This will clear all the print areas (in case you have set more than one range of cells). In case, you only want to remove some cells and not clear the entire print area, edit the name range from the name manager. How to Insert Page Numbers in Excel Worksheets. How to Print Comments in Excel. Thanks for the great videos. I have been watching your videos for a while and I really learned a lot from your tutorials. I have been a Linux user since 2007 and even before switching to Linux, I had been using LibreOffice (OpenOffice previously). In Libre, we can set a different page style for each sheet in a workbook. I mean we can set different margins and page layouts independently for each sheet. Can we do this in Excel ? Secondly, I was working with a price list in an xlsx file at work. And I was trying to publish the entire workbook into PDF. While trying to set the print area, although I choose width of the page should be as wide as the active columns in the sheet, when I look at the Print Preview, still it was scaling and shrinking to the left of the page. In other words, although I choose that page width should be from column A to M, let’s say, it sets the print are accordingly, however, it scales down the page instead of spreading to the width of the page. Interestingly, it worked for some sheets but not for some although all page details were the same. Finally, I opened the file in Libreoffice and chose fit the sheet into several pages, 5 or 6 let’s say, and it automatically fixed the problem. So, what should I have done with Excel to fix the problem ?